I have been reading the most fascinating book here in the past couple of weeks, but one with a rather intimidating name. 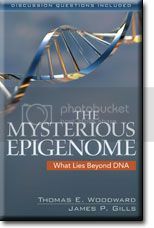 The Mysterious Epigenome by Thomas E. Woodward and James P. Gills may be a mouthful, but it is far more accessible than the title implies. I found it surprisingly easy to read. Many believers don’t understand the importance DNA has on their everyday routines. Healthy lifestyles--and healthy spiritual lives--are very much related to the epigenome, the control system of the cell. It’s time for Christians to learn the amazing and mysterious benefits of understanding what lies beyond DNA.In this creative and inventive treatment, authors Thomas E. Woodward and James P. Gills take readers on an exploration of the human epigenome. Acting as tour guides leading visitors through a 3-D model of a human cell, Woodward and Gills bring to life the human molecular makeup. Readers (as visitors) will get up close and personal with the minute details of human molecular structure, including E. coli, flagellum, a DNA helix, an RNA molecule, and more. By seeing it with their own eyes, readers will gain a better understanding of their genetic systems and a better appreciation for the Creator who put this all into place. Perhaps the most exciting aspect of understanding epigenetic information is the potential to proactively reprogram the human epigenome to allow for improved physical and spiritual health. Readers will discover how epigenetic damage can lead to rare forms of cancer and other ailments and how improved healthy lifestyles can cure the epigenomes, preventing the communication of hereditary setbacks to future generations. “Our hope,” write the authors “is that this book will be but the start of an awe-inspiring journey. This book surprised me. I had never heard of "epigenomes" before. Genomes? Yeah, you know, like the Human Genome Project. I vaguely knew about genomes. DNA, now that is a term I remember very, very well from my college biology and genetics courses <cough> a quarter century ago. So what are all these things? DNA is pictured on the cover -- that twisted ladder looking thing -- and the genetic information of a living thing is encoded within the DNA. A genome, basically, is another name for all of that genetic info on the DNA. So what is this epigenome thing? I had no clue. Now I do. What scientists have found as they explored this final frontier of the human genome is that this is NOT the final frontier. Genomes do a lot, obviously. But the epigenome (epi- being Greek with a meaning of "over" or "above") is all the various kinds of "control information" that drive our DNA. Fascinating. This book is now required in my household while studying high school biology.